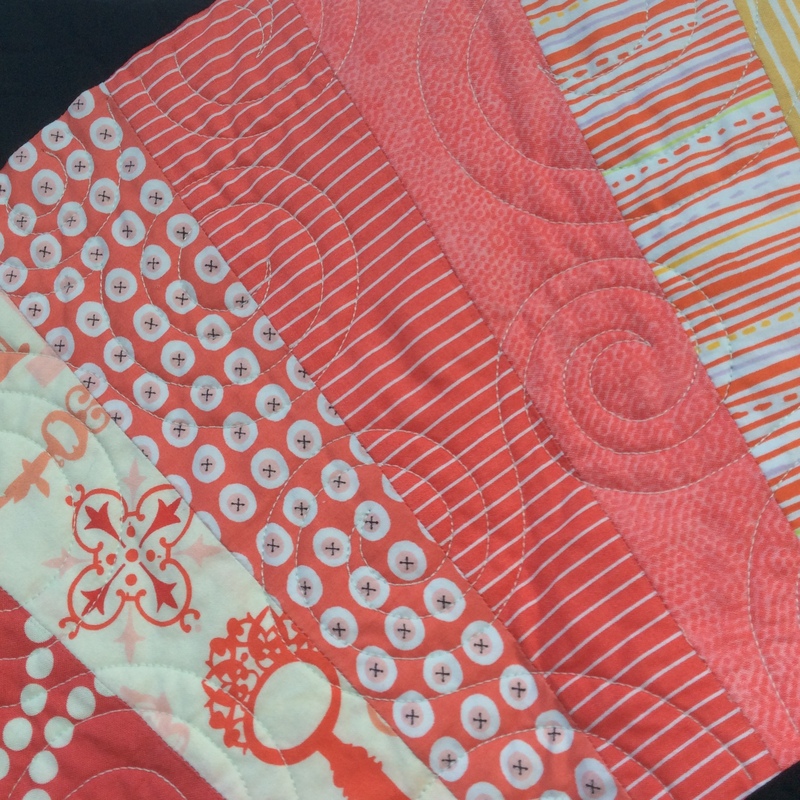 North Shore Quilter – Kick off your shoes and enjoy some quilting. 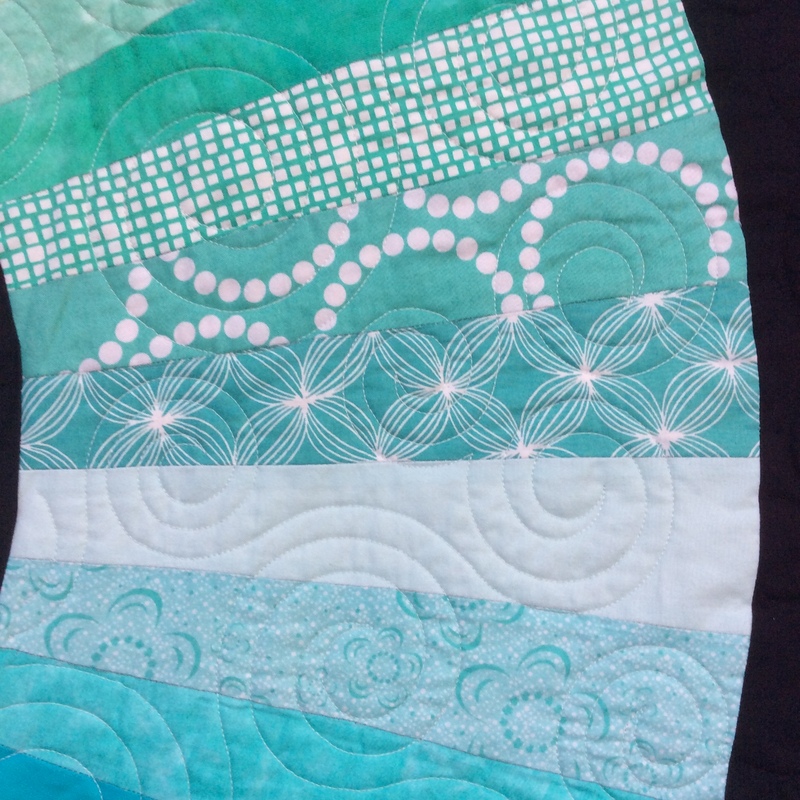 Kick off your shoes and enjoy some quilting. 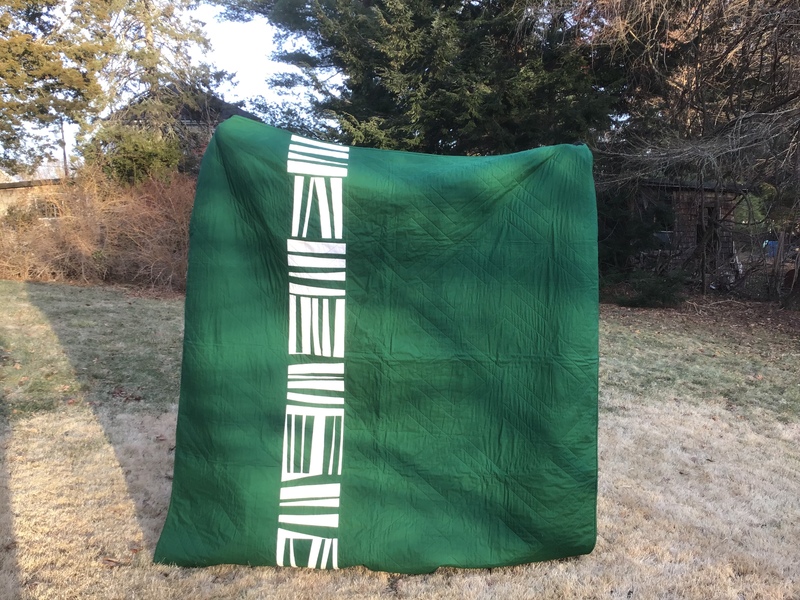 I made this quilt to celebrate my nephew, who graduated last spring from Michigan State with a degree in environmental engineering. I designed it in the hopes that it would read as modern and masculine. Green and white are Michigan State’s colors. 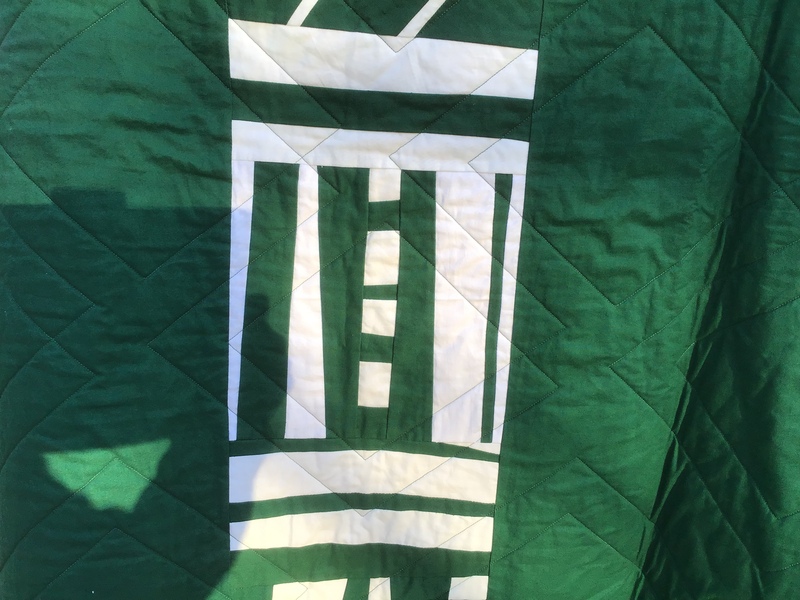 It’s a reversible quilt, as shown by the front (above) and the back (below). I rented time on a longarm for the quilting. I went with an all-over diamond grid because I wanted to keep things simple. Michael graciously let me keep the quilt for a few months after his graduation so I could enter it in my county fair, where it won a third place. I’m so proud of Michael, who is an all-around awesome guy. When I became a mom, he looked at me solemnly and promised me that he’d play with my son, just as his aunts and uncles had played with him when he was growing up. He has kept his promise, and my 10-year-old son worships and adores him. I can’t wait to see what the years ahead hold for Michael. Nothing but good, I hope! 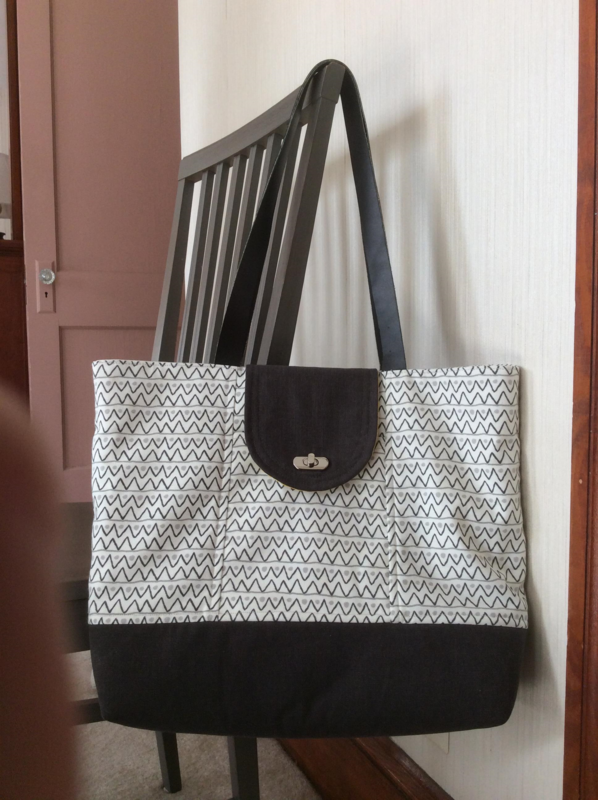 This past February I took a class at my local quilt shop on Anna Graham’s (Noodlehead’s) Explorer Tote pattern. 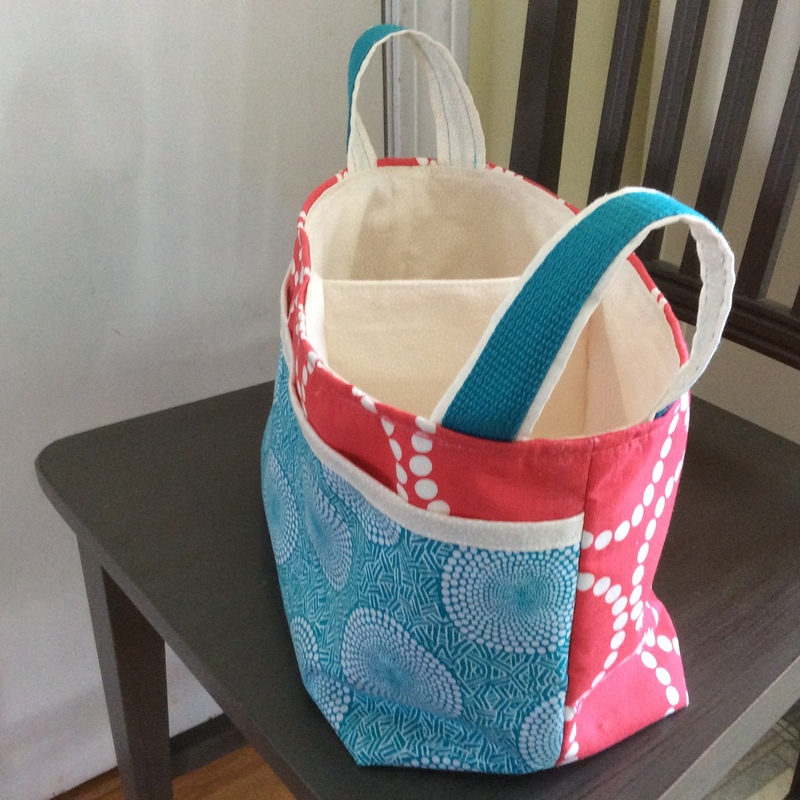 It was a four-hour class and I had to hustle every minute to stay up with everyone else, but with some work at home afterwards, I finished the bag. The pattern was very well-written, but I was glad to have an instructor to guide me through it. It calls for a recessed zipper but I left out that step. 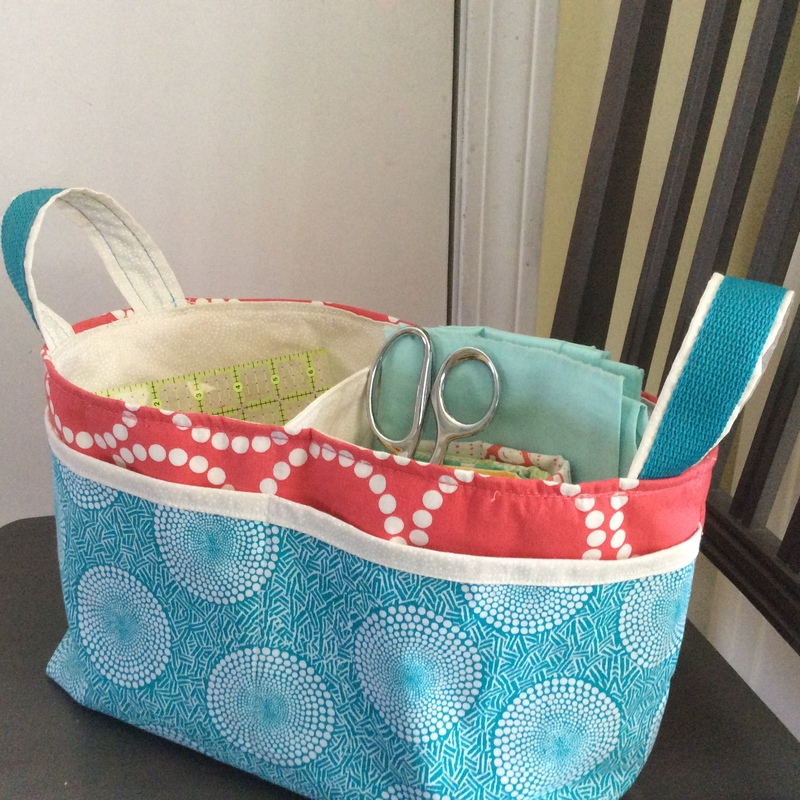 When I make another one of these totes, I will definitely try the zipper. The bag comes in two sizes. Mine is the smaller one (18″ wide, 13″ high, 4″ deep). 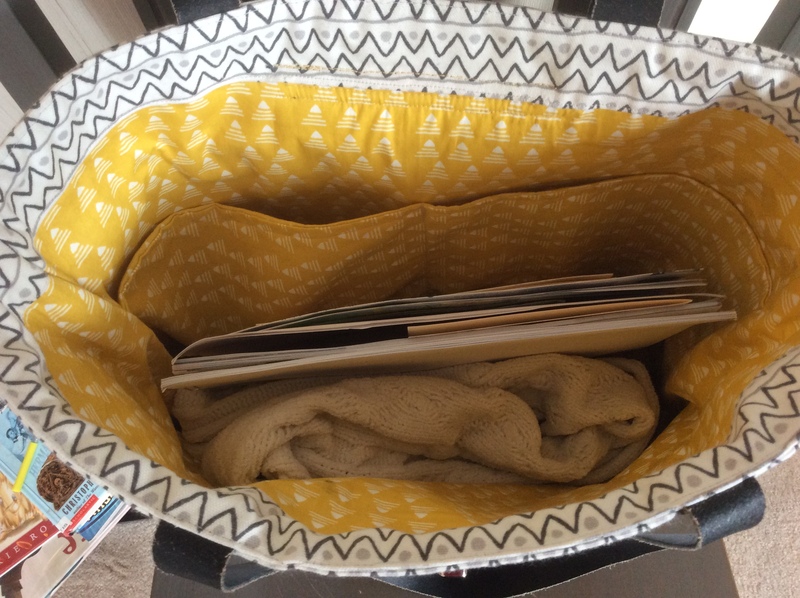 It holds books, a purse, notebooks and even a laptop (if I squeeze it in). The larger size is 22″ wide, 14″ high, and 7″ deep. It’s sturdy since I followed the pattern directions and used ByAnnie’s Soft and Stable as an extra layer of interfacing on the bottom. Making the pattern introduced me to two new techniques — installing rivets on the back pockets and using a turn lock on the front. One of the women in the class urged all of us to try using rivets and even shared her supplies. It was the first time I used them and I love the professional touch they add. Installing the turn lock took multiple tries. I watched this video by Anna Graham over and over until I got it. The trick was to keep trying to install the screws until everything fit snugly. I’ve used the bag a couple of times and love it. 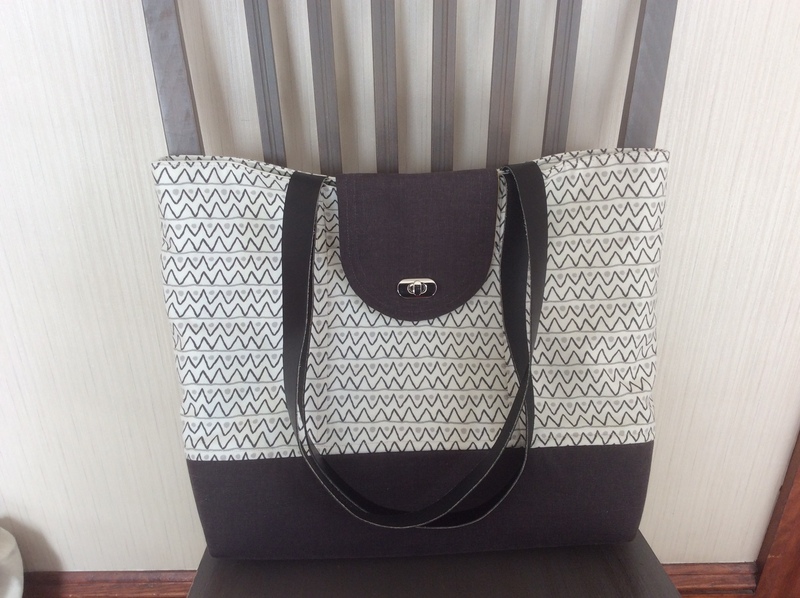 It goes well with many colors because of its neutral shape and fabric. I’ll be linking to Crazy Mom Quilts (Finish It Up Friday). About a year ago I bought Cindi Edgerton’s Roman Stripes pattern while in Pennsylvania because the simple design really spoke to me. 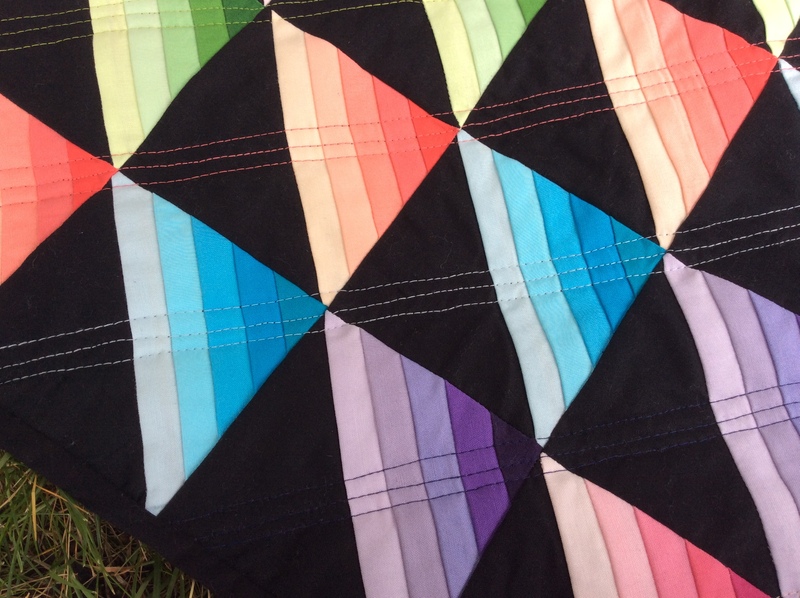 I did diagonal quilting with my walking foot, matching the thread to the fabric colors. Working on a wall hanging instead of a full-size quilt made it easier to get consistent stitches on my home sewing machine. 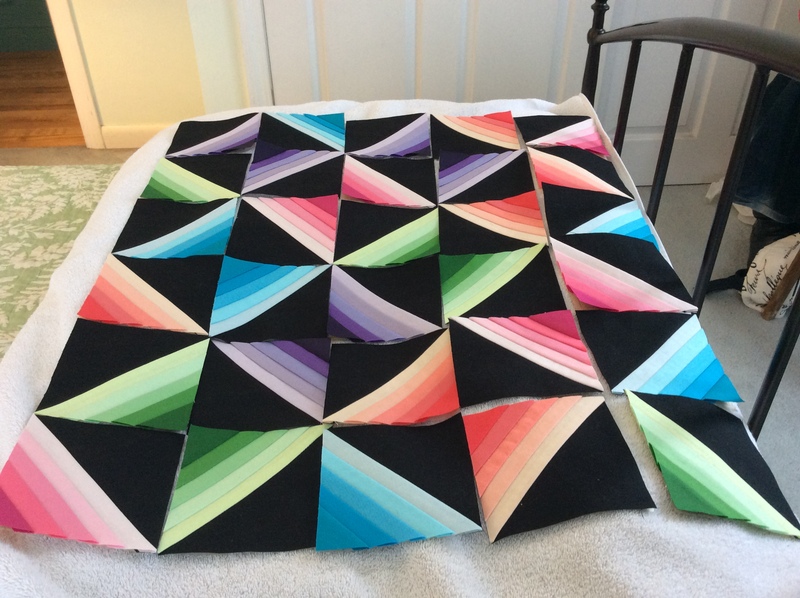 I like the way the quilt turned out, although the colors look more fluorescent when they’re all together than they did when I was choosing fabrics. 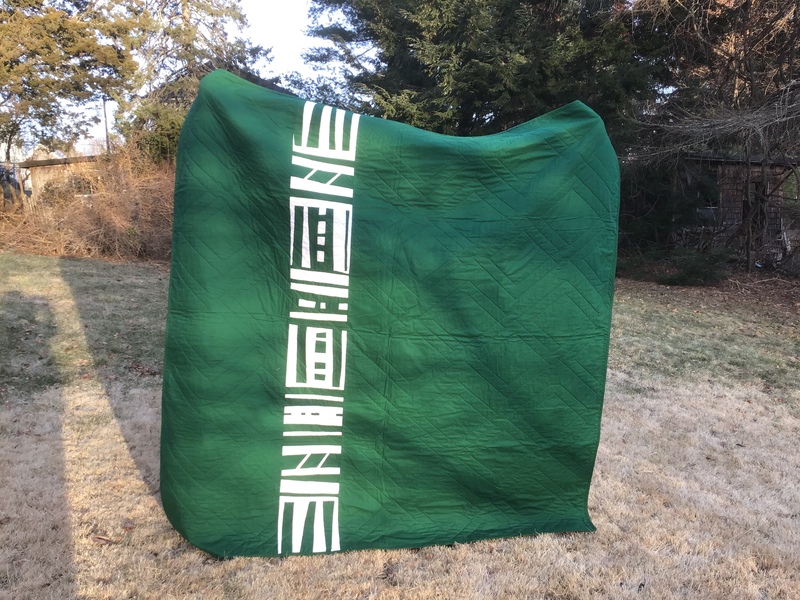 I designed the back myself while on retreat with the Seacoast Modern Quilt Guild. 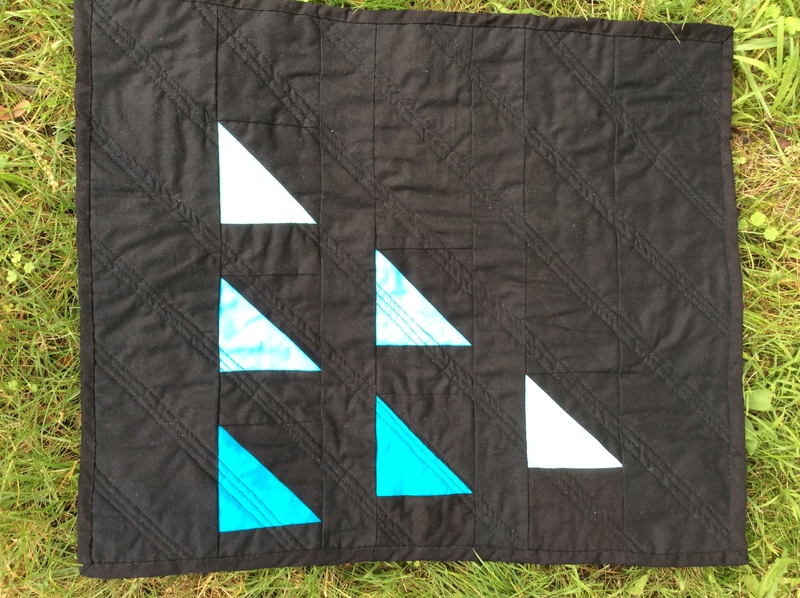 I wanted to echo the triangles on the front, using various shades of a single color. 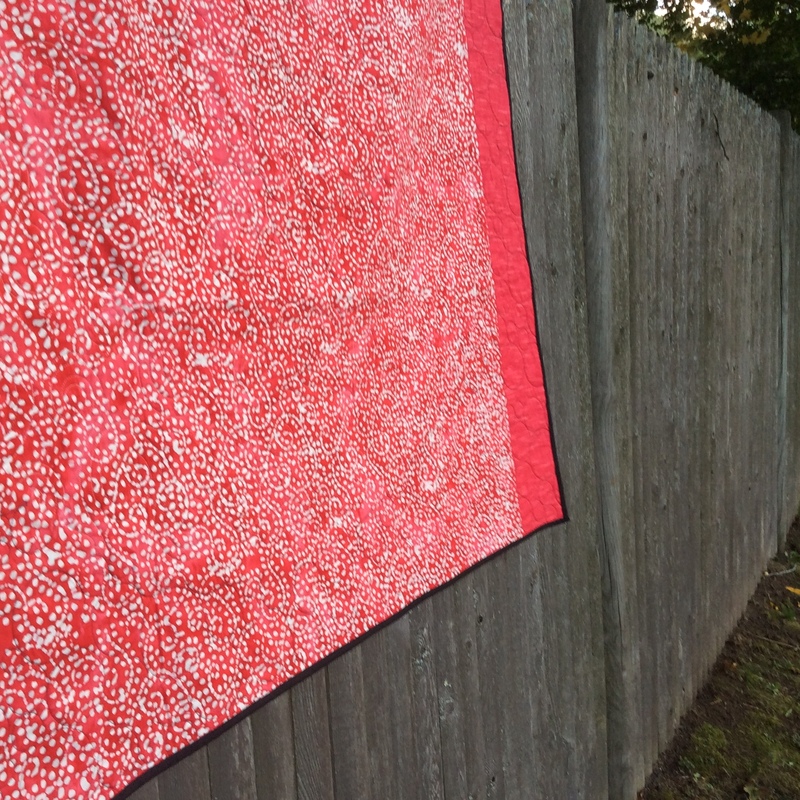 I’m linking up to Crazy Mom Quilts. 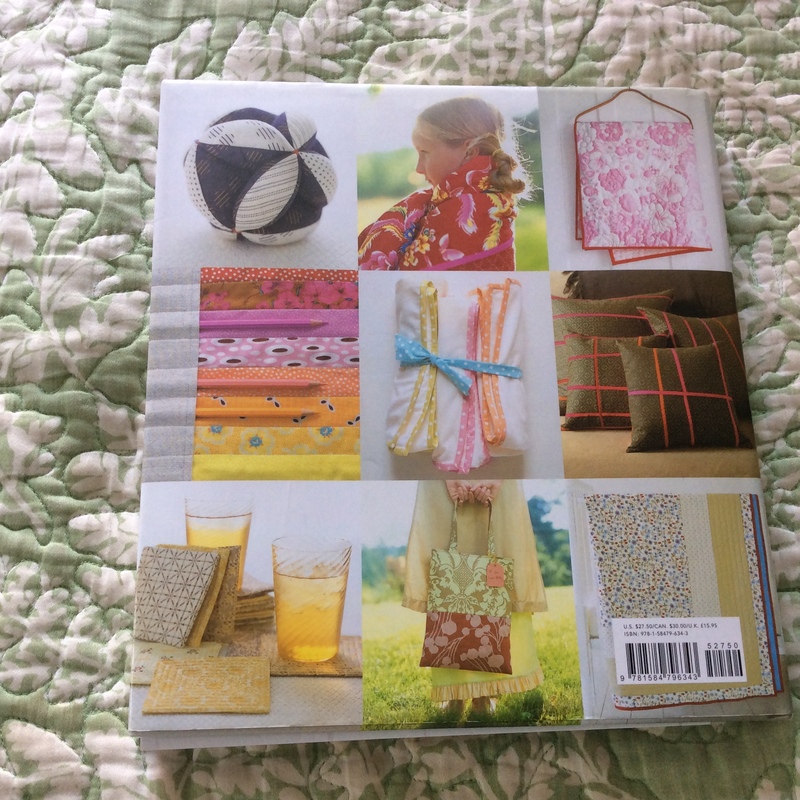 Last summer, I bought a Roman Stripes pattern by Cindi Edgerton. I loved the simplicity of the design and the gradation of colors from dark to light. Turns out that the pattern was paper pieced, a method I’d never tried. I discovered that I like paper piecing. Now I’m at the point where I’m deciding between two layouts. I’m leaning toward the more traditional layout at this point, but I will give myself more time to decide before I start sewing the squares together. 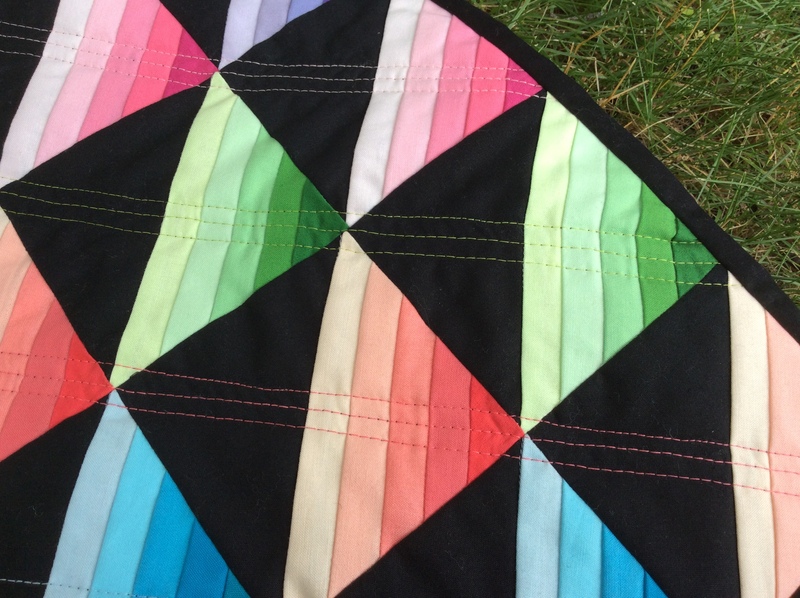 What’s your best method for making up your mind about quilting questions? The winner of Last-Minute Patchwork and Quilted Gifts is Danette. I’ll be in touch regarding a mailing address. 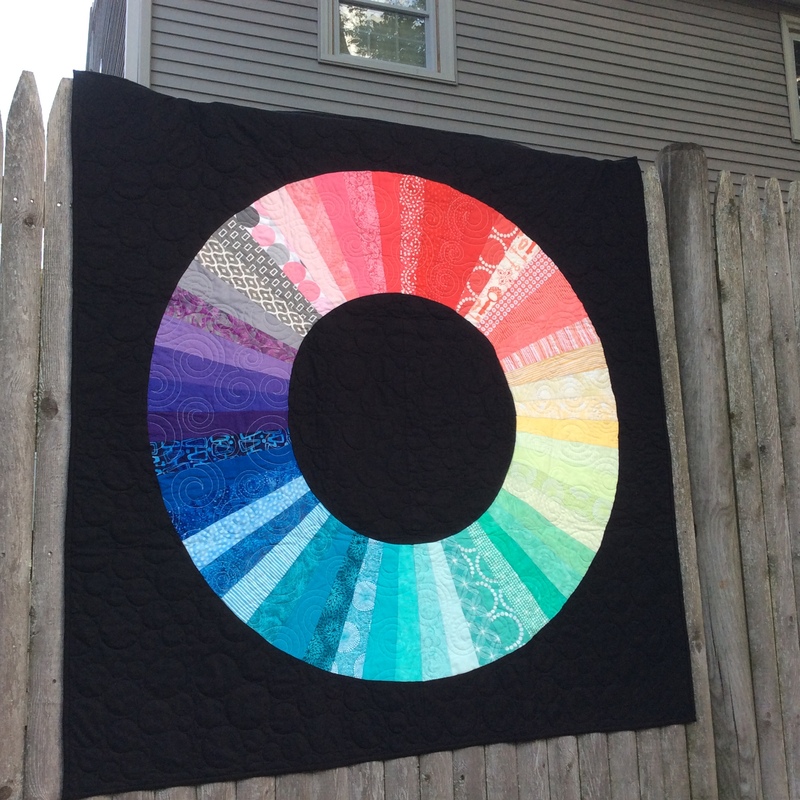 This pic on this post shows the back of the color wheel quilt. 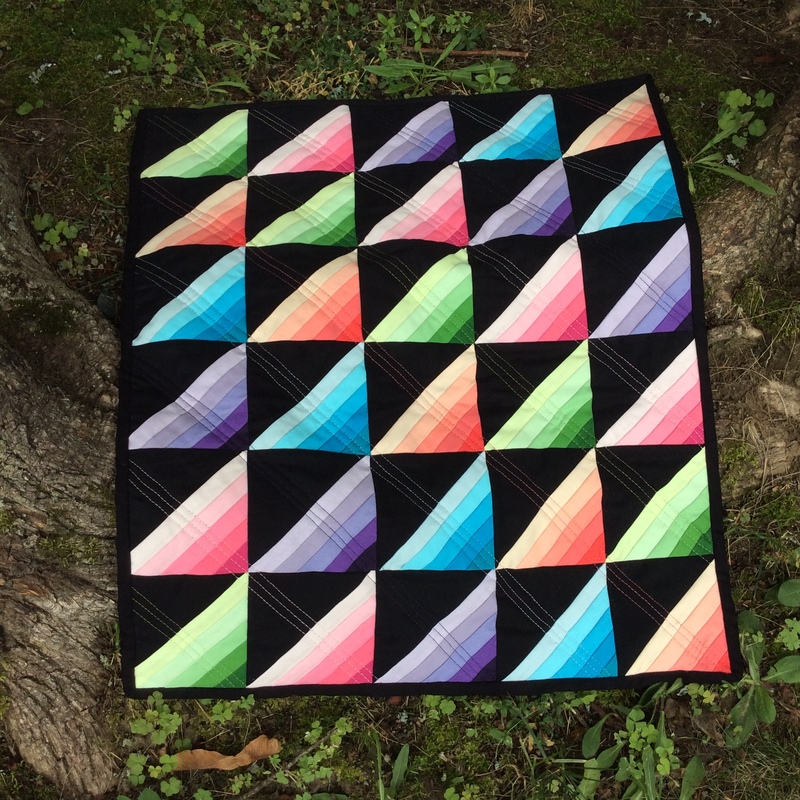 I found the pattern for this Color Wheel Quilt in Last-Minute Patchwork and Quilted Gifts by Joelle Hoverson, owner of Purl Soho in New York City. 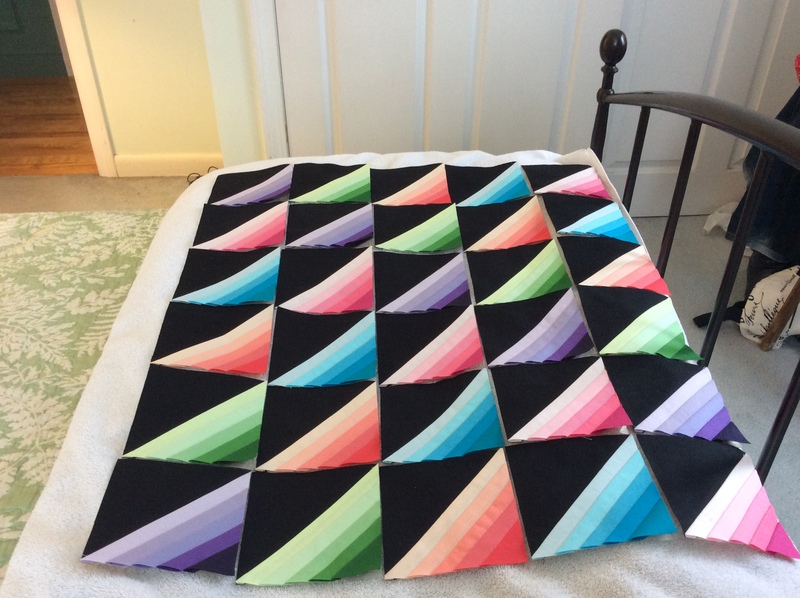 It took me almost 18 months to make because piecing curves was a new skill for me, and also because I tried to quilt it on my home machine, but I couldn’t escape fabric puckers. After spending hours ripping out stitches, I took a one-day course on using a longarm machine at Laurena’s Longarm Quilting and then rented time on her computerized machine. 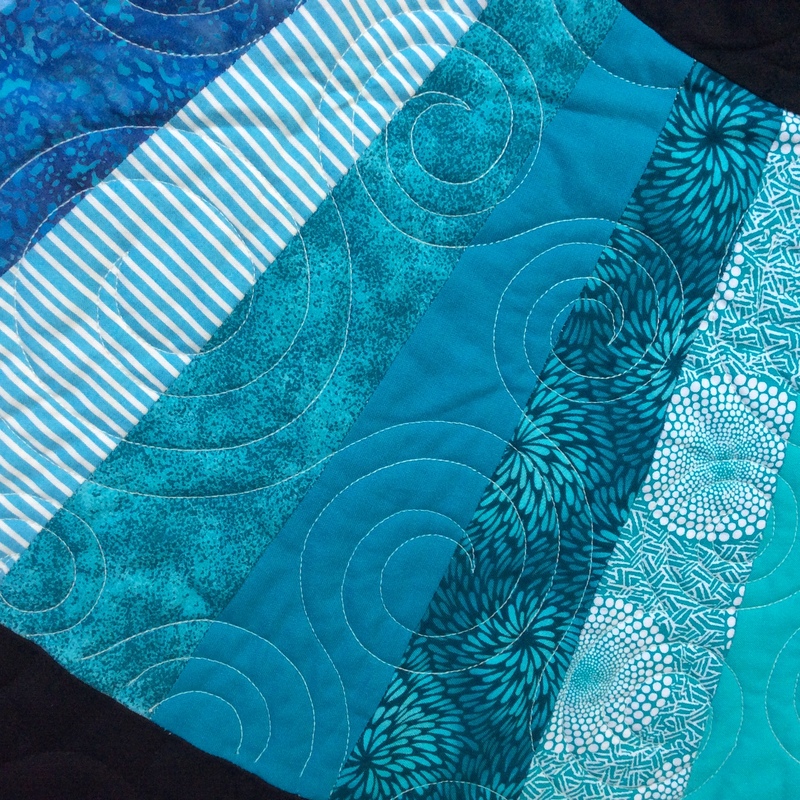 I used two patterns for the quilting — bubbles for the black sections and a swirl pattern for the colored panes. I love the way the thread colors blend into the fabric. I really wanted the piecing to be the star of the show. When I was picking out the fabric for the quilt, I visited Purl Soho in New York City. While standing at the register to pay for my fabric I discovered that my purse was missing. Purl Soho staffers couldn’t have been nicer. They let me use their classroom space to empty out my backpack in search of my purse and even gave me a muslin “Purl Soho” bag when I left. Weeks later, after many anxious phone calls to Grand Central Station (where I had put my purse down while eating my lunch) I recovered my purse — with everything still in it! 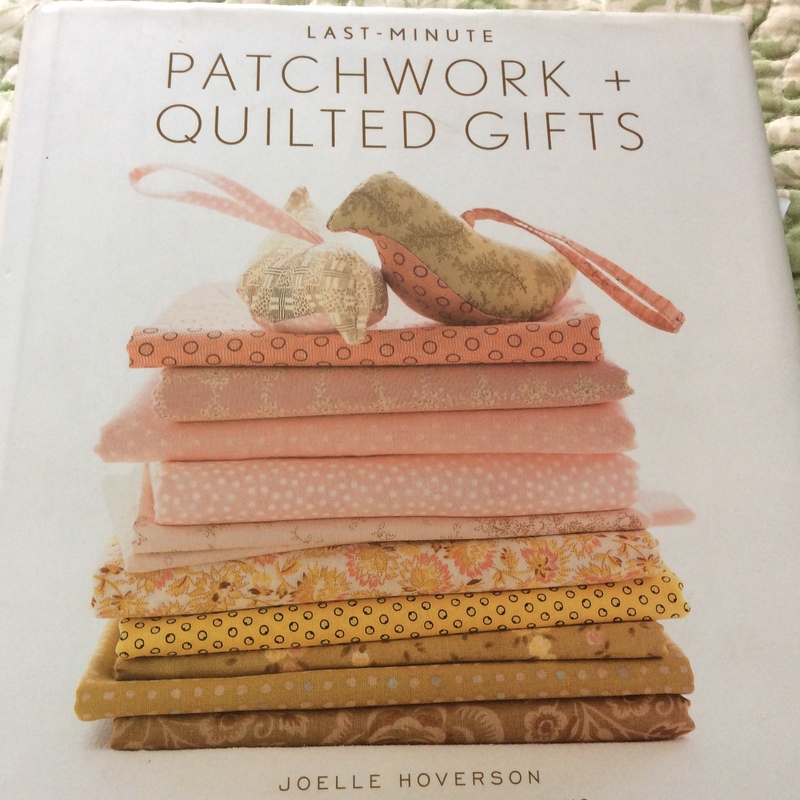 I have no idea who turned in my purse at Grand Central Station, but as a way of paying it forward (and thanking Purl Soho), I’m giving away a copy of Joelle’s book. It has many fantastic projects as well as stunning photography. If you want to enter the drawing, just leave a comment here telling me the first name of someone for whom you want to do a good turn. Giveaway open until Tuesday, Nov. 15. I’ll post the name of the winner here. For years I have admired Anna Graham’s Divided Basket. I finally took the plunge to buy a pattern during a recent sale. Because I am trying to use up the fabric in my stash, the cream is the only fabric I bought for this project. The orange is the Pearl Bracelets print by Lizzy House. I had wanted to use it for years but had never found a pattern that could handle the bright color and large-scale print. I can’t remember what line the blue fabric is from (I’ve probably had it for five years), but I like the way the orange and blue play off each other. That’s what complementary colors excel at, right? 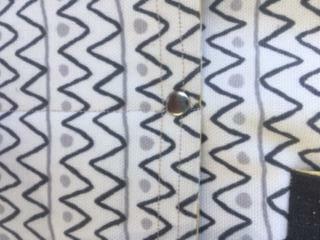 I also like the way the circles in the two fabrics echo each other. If you haven’t seen Anna Graham’s blog (noodle-head.com), check it out. Her work is amazing!